These days Mercedes charges AMG with producing its high-performance vehicles. But back in the 1990s, Daimler had yet to take over the tuner in Affalterbach. So it partnered with another automaker right there in Stuttgart to produce the E500. Based on the 124-generation E-Class, the E500 (and the 500E as it was badged before its mid-cycle refresh) was a sleeper: a wolf in proverbial sheep's clothing. It looked pretty much like any other E-Class sedan, but hid a secret underneath its subtly enhanced bodywork. Namely a 5.0-liter V8 borrowed (and enhanced) from the SL500 roadster. With its own fuel-injection system and lowered deck height (to fit under the hood), the quad-valve, eight-cylinder engine produced 326 horsepower. That may not seem like much by today's standards, but it was more than the Ferrari 348 offered at the time, and returned an even quicker 0-62 time of 5.9 seconds. 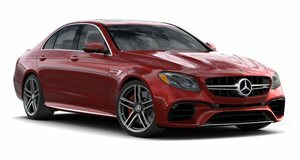 It also sat lower to the ground by 23 millimeters, with wider fenders and a smattering of other visual upgrades that took a second glance to distinguish from an ordinary E-Class sedan. And it owes its development, as well as its production, to Porsche. Having overseen its transformation, Porsche also handled the E500's production. The bodies-in-white were pulled off the assembly line in Sindelfingen and carted across town to the Zuffenhausen district for final assembly – long before Porsche ever dreamed of making the Panamera, or Mercedes went after its cross-town rival's 911 with the AMG GT.